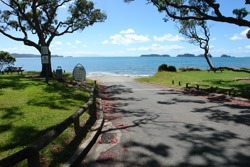 There’s always plenty to do here at Martins Bay – simply kick back, relax under the shade of a Pohutukawa tree and read a book, or enjoy a range of activities. There’s something for the whole family. Two fun playground areas – one within the safe grounds of the holiday park, and another in the public reserve bordering the park grounds. The beach is right on your doorstep!. Martins Bay is sheltered and provides safe swimming conditions with a sandy beach. Offshore during the summer months there is a swimming pontoon, so that you can enjoy swimming even when the tide is out. Kayaks are available for hire from the holiday park office. These provide a great way to explore the bay. Our fishing and boating facilities are second to none. With a well-equipped fish cleaning area, boat-washing facilities, boat and trailer parking, authorised weigh station and an all-weather boat ramp, Martins Bay is the place to pursue your passion for fishing and boating. 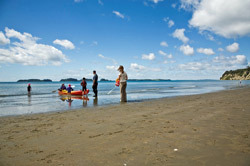 Each year, Martins Bay Holiday Park hosts a fishing contest in the summer months. The Hauraki Gulf is right on your doorstep, so you can get out on the water and explore Kawau and the other islands, all within easy boating distance.